As the leading gold buyer in Houston, we work closley with Leads Online, a national tracking system that reports to local authorities to prevent the sale of stolen goods. Even as closey as things are monitored there is always the chance of something getting missed, especially when you realize that you never took a good picture or recorded the serial number. What would be the best way to avoid your items from being missed. Why register them with ReportIT from Leads Online!!! What is ReportIt? 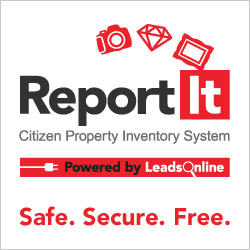 ReportIt is a proactive tool provided to you because your local law enforcement agency wants you to be prepared in the event of a theft or loss. It allows you to easily store and organize information about your valuables. You can store serial numbers, owner applied numbers, photos of property and scans of receipts. It is all internet based, so your data stored is always safe so you never have to worry about loosing it. This service is 100% free to you, and will assist law enforcement angencies in helping to ensure the safe return of your valuables. If you would like anymore information on the Report It service please feel free to visit the FAQ page Here.